With the partial shutdown of the federal government in its third week, both opponents and supporters of expanding the U.S.-Mexico border wall overwhelmingly oppose making concessions to end the stalemate. A new Pew Research Center survey finds that majority of Americans (58%) continue to oppose substantially expanding the border wall, while 40% favor the proposal. Overall opinion on the wall is little changed from last year, but these views have never been more sharply divided along partisan lines: Republican support for the wall is at record high, while Democratic support has reached a new low. And both sides appear to be dug in: Nearly nine-in-ten (88%) opponents of expanding the border wall say it would not be acceptable to pass a bill that includes President Donald Trump’s request for wall funding, if that is the only way to end the shutdown. 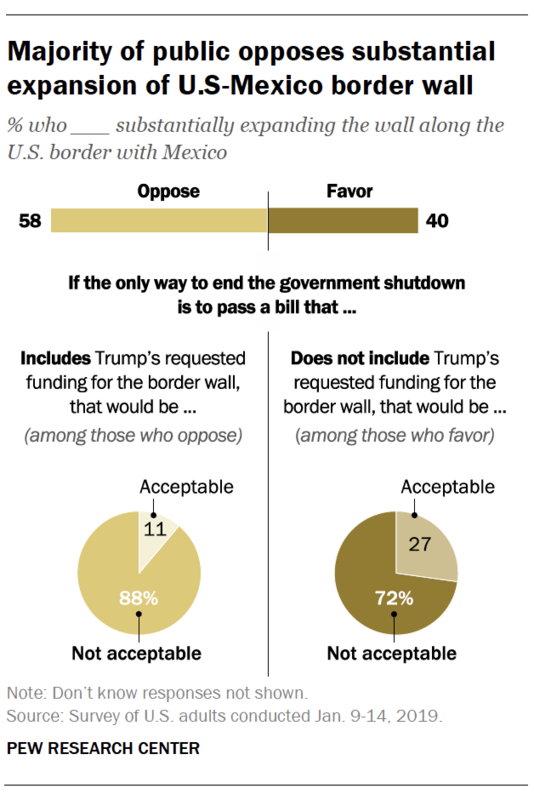 Among the smaller group of wall supporters, 72% say a bill to end the shutdown would be unacceptable if it does not include Trump’s funding request. At a time when there are wide partisan differences on most political issues, the divisions over the shutdown and border wall are especially striking. Democrats and Republicans disagree on whether the border wall would reduce illegal immigration into the U.S. and on the impact of the shutdown on the country. Nearly eight-in-ten Democrats and Democratic-leaning independents (79%) say the shutdown is a “very serious problem”; fewer than half as many Republicans and Republican leaners (35%) say the same. The new survey, conducted Jan. 9-14 among 1,505 adults, finds that none of Washington’s political leaders receives positive approval ratings for their handling of the government shutdown. Just 43% approve of the way Democratic congressional leaders are handling the government shutdown, while smaller shares approve of how Donald Trump (36%) and GOP congressional leaders (also 36%) are handling the shutdown. Trump’s overall job approval stands at 37%, which is little changed from measures over the past year. Trump’s support among Republicans and Republican leaners remains high (80% approve), while nearly all Democrats and Democratic leaners (96%) disapprove of his job performance. The partisan gap in Trump’s job approval is wider than for any president in more than six decades. Public views of a U.S.-Mexico border wall have changed little over the past three years. But the partisan gap has widened, as Republicans have become more supportive of a border wall, while Democratic support has declined. Currently, 58% of Americans oppose substantially expanding the wall along the U.S. border with Mexico, while 40% favor the proposal. Since early 2016, roughly six-in-ten Americans have opposed building or expanding the border wall (in 2016-2017 the question asked about “building a wall along the entire border with Mexico”). Yet partisan differences are now wider than they have ever been. Today, 82% of Republicans and Republican leaners favor substantially expanding the wall along the U.S-Mexico border. Over the past year alone, Republican support for expanding the border wall has increased 10 percentage points (from 72% to 82%). Over the same period, the share of Democrats who favor expanding the U.S.-Mexico border wall has declined from 13% to 6%. 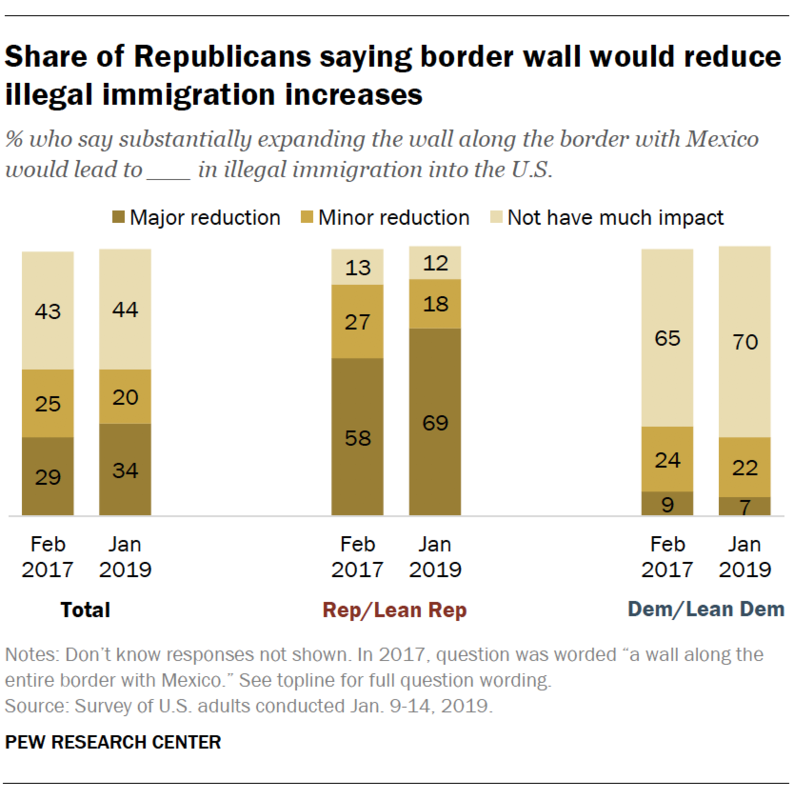 Conservative Republicans and Republican leaners (who make up about two-thirds of all Republicans and GOP leaners) overwhelmingly favor expanding the U.S.-Mexico border wall (91% favor). Moderate and liberal Republicans are somewhat less supportive (69% favor). Overwhelming shares of both liberal Democrats (97%) and conservative and moderate Democrats (89%) oppose expanding the border wall. As in the past, opinions about expanding the U.S.-Mexico border wall are divided by race, education and age. Whites (46% favor) are more than twice as likely as blacks (20%) or Hispanics (23%) to favor expanding the border wall. And support for expanding the wall is much greater among older adults. About half of those ages 50 and older (48%) favor substantially expanding the border wall; just 25% of those ages 18 to 29 and 36% of those 30 to 49 say the same. Roughly a third of Americans (34%) now say substantially expanding the U.S.-Mexico border wall would result in a major reduction in illegal immigration into the U.S., up from 29% two years ago. Two-in-ten say expansion would lead to a minor reduction in illegal immigration, while a plurality (44%) continues to say expanding the wall would have little impact. Nearly seven-in-ten Republicans (69%) now say expanding the wall would lead to a major reduction in illegal immigration into the U.S. – up from 58% who said the same in 2017. Conservative Republicans (79%) continue to be far more likely than moderates and liberals in the GOP to say expanding the wall would lead to a major decrease in illegal immigration. Among Democrats, 70% say expanding the border wall would not have much of an impact on illegal immigration into the U.S., which is changed only slightly from two years ago (65%). As in the previous survey, whites (39%) are more likely than blacks and Hispanics (22% each) to say the expansion of the wall would lead to a major reduction in illegal immigration into the U.S. By contrast, blacks (64%) and Hispanics (54%) are more likely to say the wall would have no impact. Among the public overall, 29% both favor substantially expanding the border wall and say passing a bill that does not include the president’s requested funding would be unacceptable even if it is the only way to end the government shutdown. But a far larger share of the public – about half (51%) – takes the starkly opposite view, expressing both opposition to the wall and saying that a bill that includes funding for wall expansion would be unacceptable, even if it’s the only way to end the shutdown. These views largely break along partisan lines: 84% of Democrats and Democratic-leaning independents both oppose the wall and say funding for it would be unacceptable. 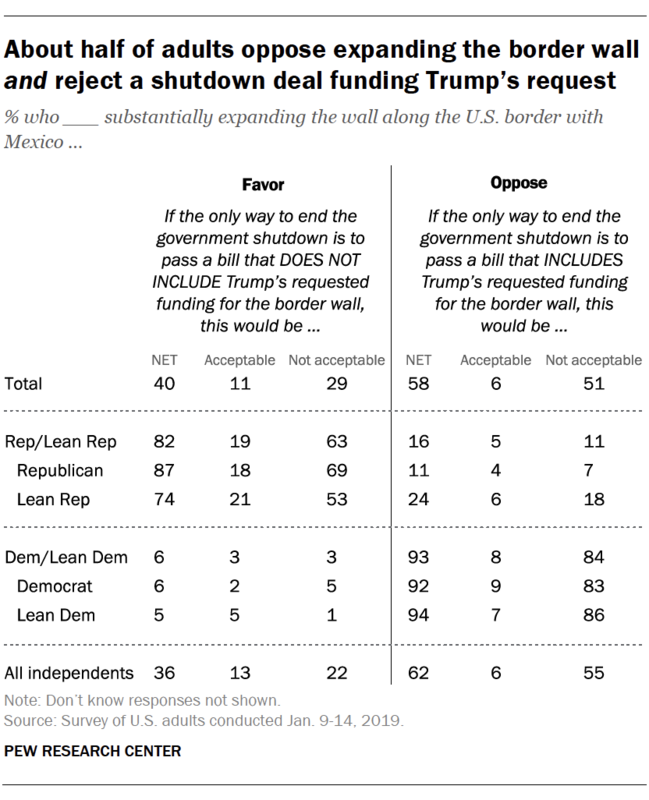 Among Republicans and Republican leaners, a smaller majority (63%) both favor the wall expansion and say not funding it would be an unacceptable way to resolve the shutdown. Within the Democratic coalition, there is no difference on these views between those who identify as Democrats and independents who “lean” to the party. By contrast, those who identify as Republicans are more likely to favor expanding the wall than those who lean to the GOP (87% vs. 74%). And while 69% of those who affiliate with the Republican Party say a deal to end the government shutdown that does not include Trump’s funding request would be unacceptable, only about half of Republican leaners (53%) say the same. Most Americans offer negative evaluations of the way that the nation’s political leaders in both parties – Donald Trump, Democratic congressional leaders and Republican congressional leaders – are handling negotiations over the shutdown. Overall, just 36% of the public approves of how Trump is handling negotiations over the government shutdown, including 23% who say they strongly approve. About six-in-ten (61%) disapprove of Trump’s approach to the negotiations, including 53% who say they strongly disapprove. 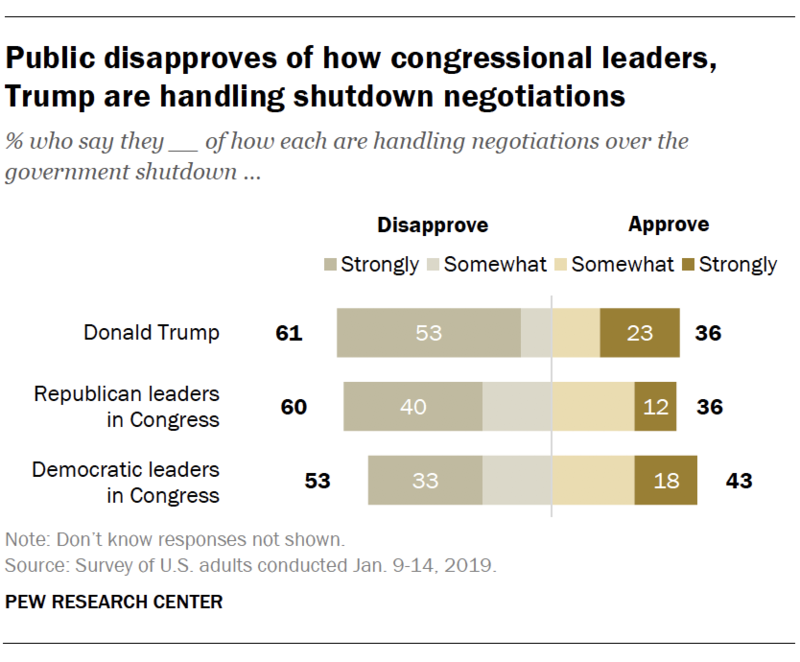 Views of how Republican leaders in Congress are handling shutdown negotiations generally parallel evaluations of Trump. Six-in-ten Americans say they disapprove of the way Republican congressional leaders are handling negotiations, while just 36% say they approve. However, fewer Americans characterize their views of GOP leaders’ handling of negotiations as “strong” approval or disapproval than say this about the president. Public views of Democratic leaders’ handling of the shutdown talks are somewhat more positive than views of Trump or GOP leaders. Still, more disapprove (53%) than approve (43%). In evaluations of how each is handling shutdown talks, Trump elicits stronger opinions than Democratic and Republican congressional leaders. Overall, 75% of adults characterize their opinion of Trump’s handling of the shutdown negotiations as either strongly disapproving (53%) or strongly approving (23%). By comparison, only about half of Americans offer strong evaluations of how congressional leadership in both parties are handling the negotiations. Among Republicans and Republican-leaning independents, 76% approve of how Trump is handling shutdown talks, including 50% who say they strongly approve of Trump’s approach. In contrast, just 4% of Democrats approve of Trump’s handling of the negotiations, while 93% disapprove (including 87% who say they strongly disapprove). The overall pattern is similar in views of Republican leaders in Congress: 69% of Republicans approve of their party’s leaders’ handling of negotiations, while just 10% of Democrats approve. And while about seven-in-ten Democrats and Democratic leaners (71%) approve of the way Democratic leaders in Congress are handling the shutdown negotiations, just 11% of Republicans say the same. 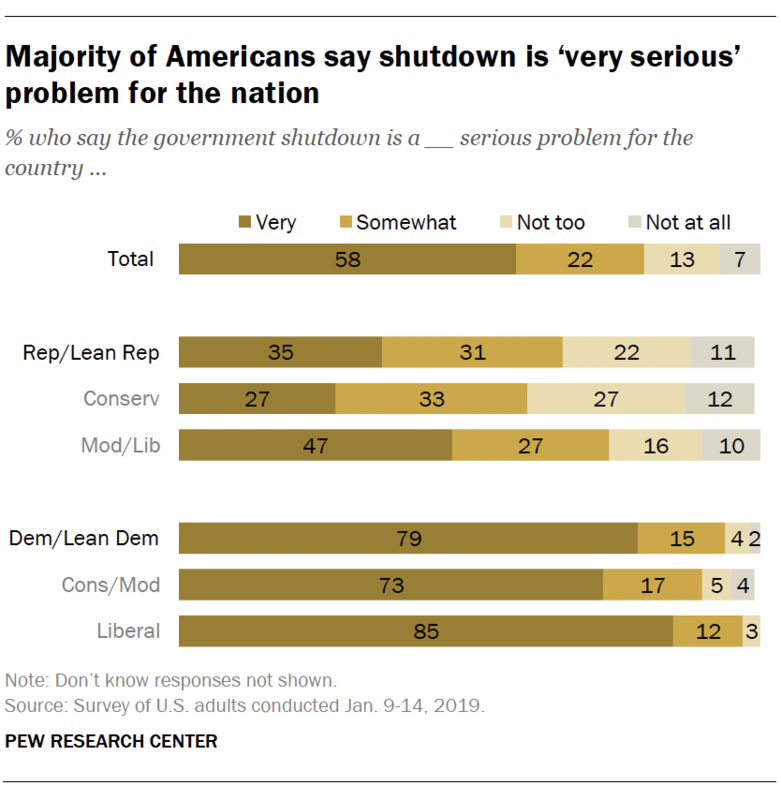 About six-in-ten adults (58%) say the government shutdown is a “very serious problem” for the country today, while 22% view it as a somewhat serious problem; just two-in-ten say that it is not too (13%) or not at all (7%) serious a problem for the country. 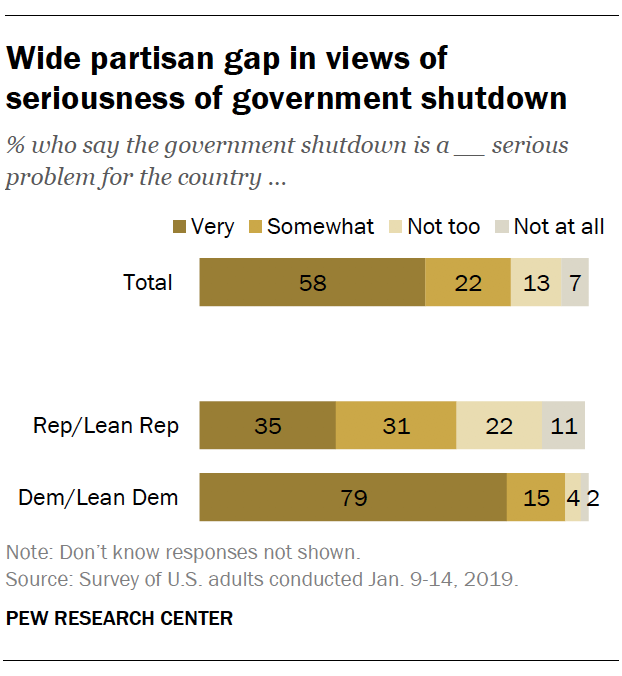 Democrats are far more likely than Republicans to view the shutdown as a very serious problem for the nation: Nearly eight-in-ten Democrats and Democratic leaners (79%) say this, compared with just 35% of Republicans and Republican leaners. Only about a quarter of conservative Republicans and GOP-leaning independents (27%) see the shutdown as a very serious problem facing the country, compared with 47% of moderate and liberal Republicans. Ideological differences among Democrats are more modest: 85% of liberal Democrats consider the shutdown a very serious problem, while 73% of conservative and moderate Democrats say the same.